Say no to the arms trade in 2013! Are you planning to take action against the arms trade in 2013? Or maybe you’d like to take action but are not sure how to get started? DSEI, the world’s largest arms fair, threatens to return to London in 2013. It is at the heart of the global trade in arms: repressive regimes are routinely invited, and activists have previously found banned equipment (including cluster bombs and torture equipment) on sale. As money becomes tight, the arms business will do whatever it can to keep its profits high. It is vital that in 2013 we make an impact on this deadly trade. 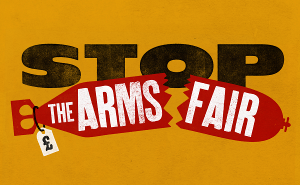 Stop the Arms Fair, a coalition of different groups including Campaign Against Arms Trade, East London Against Arms Fairs, Disarm DSEI and others, will be running a series of workshops in the first half of 2013. We want to support groups to find out more and take action during what will be a key year of resistance to the arms trade. To make these workshops as accessible as possible, we are happy to come to you and work with people in your local group(s). Ideas for actions: including examples of previous creative actions against the arms trade, such as the successful 2012 campaign to Disarm the National Gallery, as well as top tips on how to plan your own creative action. Arms on your doorstep: the latest information about arms companies and arms trade events near you, drawn from CAAT’s extensive map of the arms trade backed up by current research. Stop DSEI! Find out about the world’s largest arms fair, which threatens to return to London Docklands in 2013, and find out you can do to stop it! Understanding direct action: help, tips and training from experienced direct action campaigners. Working in affinity groups: working together as a team to get results. If you’d like to host one of these events, please let us know! Contact info(at)stopthearmsfair*org*uk. The workshops themselves are free but a contribution to travel expenses would be welcome. If you are not able to host a workshop, we will be running open workshops which you would be very welcome to attend. Keep an eye on stopthearmsfair.org.uk as dates are announced. We look forward to working with you to resist the arms trade in 2013!